Yes, I've been making some art. And no worries, I'll am also making bling. 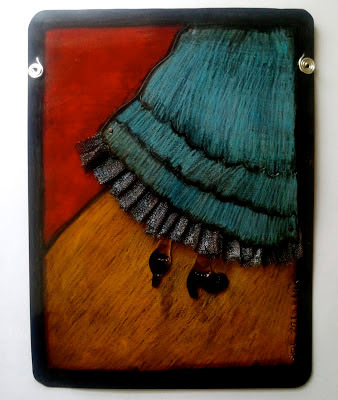 In any case, tonight my flamenco inspired piece Mis Cinco Minutos Sobre el Tablao will be on display at the Art of Body- Body of Art at Casa Familiar's The Front in San Ysidro to Celebrate El Dia de La Mujer (Women's Day). Also, my Zonia's photo series Flamenco Footwork will be on exhibited as well. She took the photos last summer during a dance class I took. My 12-year old rocks! 147 W. San Ysidro Blvd. love the colors & movement in this piece - it's gorgeous! and as for your 12-year-old's photos - wow! thank you mucho Susie! See you on the Abla site.